Are you searching for a procedure that will give you that perfect Kylie Jenner pout? You could come to one of our Botox and Filler Events, or you could try permanent lip cosmetics. This latest trend provides the ideal cosmetic solution for women who just want to wake up everyday with beautiful lip color. Who doesn’t want that?! 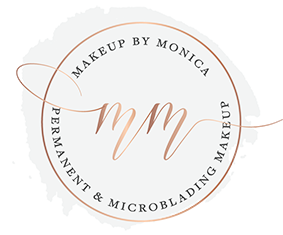 Makeup by Monica offers a customized palette of enhanced natural lip tones, or we can blend colors to match a favorite lipstick shade. Our permanent lip artistry can easily correct or enhance thin lips, irregular lip lines, or restore lost lip pigmentation. In addition, you’ll never have to worry about smearing lipstick on your teeth, color bleeding past the edges of your mouth during dinner, or reapplying that lip tint. Instead you can be confident that your pout will always be on point and that your color will never wear off. Want to know more about permanent lip procedures? Let me “fill you in”… I’ve compiled a list of need-to-know info regarding permanent lip procedures. If you have any further questions, be sure to call me at my number listed at the bottom. There are a ton of great benefits! Permanent lip procedures can enhance the beauty of well shaped lips or even reshape thin lips. They can correct asymmetry, add definition and fullness, create the appearance of larger lips, de-emphasize age lines, and prevent lipstick from bleeding into surrounding areas. Depending on what you want permanent lip liner can be applied very lightly for a soft, natural look, or heavily for a dramatic look. If you want the appearance of that “just bitten” look an opaque/sheer lip blush may be right for you. If your goal is fuller lips a full lip treatment, which combines lip liner and lip color, does wonders. It’s possible to get a color that’s close to your natural lip color—but that means it won’t last as long. The more natural the color, the more frequent your touch-ups are going be. I suggest tattooing your lips one or two shades darker or brighter depending on your natural skin tone. Treatment will begin with a consultation regarding the shape and color of your choice. I recommend bringing your everyday lipstick with you to ensure that I match a color you are most comfortable with. If you want a liner, please bring that as well. If you get cold sores or have ever had one in the past you will need an antiviral prescription from your doctor before before a lip procedure. Physicians usually instruct to take it 2 days before. Swelling and dryness will die down in about 3 days, but they will continue to look chapped as they heal, which could take as long as 10 days. You won’t usually see the full, truest color until after about two weeks. Call me with any other questions and concerns, or to set up an appointment for your consultation. In no time at all, you could be on your way to fresher looking, fuller lips!